His article illustrates EDENS’ purpose to enrich community by delving into the design, curation and engagement seen across EDENS’ portfolio, especially in the D.C. area. EDENS is a nationally leading retail real estate developer who owns and operates 125 shopping destinations around the country, totaling 15.4 million square-feet concentrated in seven major markets from Boston to Miami and across Texas. But for more than 50 years, our work has been bigger than real estate: We are in the business of humanity. We create places for communities to come together in ways that make us think, feel and engage with one another. We are shameless promoters of public space and the people who animate them. We are storytellers at the human scale, defined by the details and textures of the places we create and the urban fabric that weaves them together. The stories we tell are grounded in three fundamental beliefs: community matters, inclusive prosperity and the creative process. Communities are at the core of our life’s experiences, folding together in dynamic ways within a thriving city. At the intersection of these communities exists a powerful opportunity for people to share in the benefits of a city’s richness through culture, canvas and conversation. Infused throughout all of this is our dedication to the creative process, a dedication that pushes our people to pursue what’s new and next. This pursuit is taking place all across cities and their suburban satellites founded on trade, but now thriving on creativity and its authentic byproducts. Community matters because when we feel a part of something bigger than ourselves we take care of each other and prosper economically, socially, culturally and soulfully. Cities are home to a dizzying array of overlapping communities— each centered around a set of commonalities or shared beliefs. Understanding what makes each community unique, while establishing connections between these overlapping layers, is what allows each EDENS project to be both a unique expression of our values and a reflection of the local community. In northern New Jersey lies a prime example of just how important communities are to what we do. 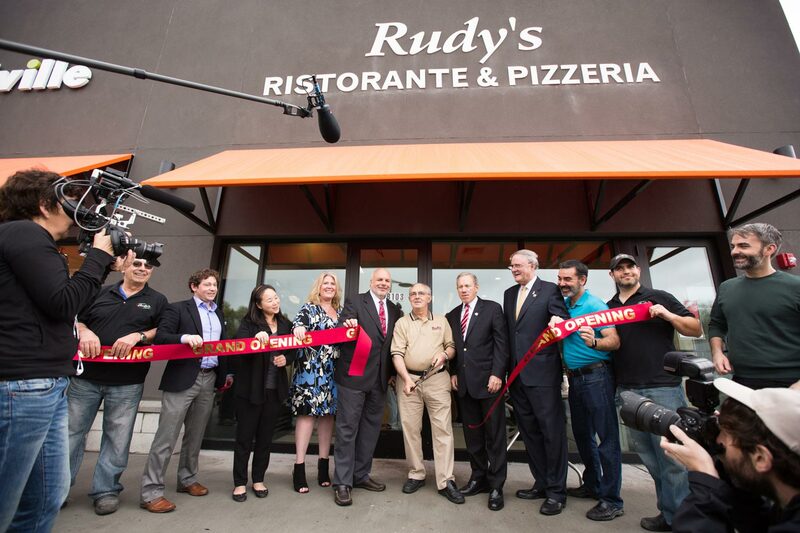 Rudy’s Ristorante & Pizzeria for generations has been the cornerstone of Closter, a small but historic borough across the Hudson River from New York City and often overlooked by redevelopment. EDENS acquired the shopping center Rudy’s called home after its bankruptcy and decades of neglect in 2012. It was clear that while the opening of a new Whole Foods Market as grocery anchor filled a much-needed void in the local community, the cultural and charismatic anchor of the renovated Closter Plaza needed to be Rudy’s. To do this, we prominently located their new home at the focal point of a new central public space surrounded by outdoor seating, interactive signage and native landscaping. The redevelopment’s architecture is now clean-lined and contemporary, but the feel is familiar and rooted in the legacy of a community staple. A relentless commitment to community enrichment elevates our purpose as a retail real estate company to create shared value. This idea of inclusive prosperity permeates our portfolio through the culture of our people and places; the canvases we use to craft experiences; and the conversations we engage in. Cities have a unique ability to facilitate the convergence of diverse people, public space and shared experience. In so doing, cities possess the possibility to deepen our understanding and empathy in each other. An empathetic city is a more livable and mutually prosperous city. DC is the apex of how EDENS weaves these narratives together to create a holistic setting where people, place and ideas come together to thrive. Every line of sight is visually clear to aid in direction, navigation, and most importantly, interaction for the hearing impaired. With its curated offerings of quality, locally sourced food, textiles and groceries, Union Market has also enabled community members to shop where they live. Our curation of entrepreneurial vendors is yet another source of prosperity in the community, so while diners and shoppers can enjoy innovative brands, like Rappahannock Oyster Bar and Salt & Sundry, fellow retail partners can also learn from and engage with local entrepreneurs like Robb and Violeta from Dolcezza. Taken together, Union Market and its namesake neighborhood have sparked a pride of place for innovators, foodies and neighbors alike. Union Market’s design and place in the greater Ward 5 community embodies the idea of inclusive prosperity. The Market repurposed an aging warehouse and garage into a sensory wonderland designed using deaf-space principles in partnership with neighboring Gallaudet University, a national leader for the hearing impaired. At their best, cities are engines of creativity fueled by people hungry to innovate, reimagine or solve for our most challenging problems. This ambition, blended with a city’s intellectual resources and tangible infrastructure, breeds innovation and urban energy. Employment, economic gains, neighborhood amenities and streetscape vibrancy inevitably follow. a vehicle for thought and execution. We lead with our people, a collective team of passionate individuals who care about the mark we leave behind. We maintain that design is more than aesthetic; we understand that humans are hardwired to notice what is different and appreciate what is authentic. Our company creates value through that differentiation and adherence to authenticity. In both the culture of our people and character of our communities, we foster a unique sense of urban-minded and impactful style that pursues inspiration from unexpected places. We collaborate with leading designers across all mediums to promote engagement through a compelling collection of visuals, language, and creative intellect. We aren’t just developers; we’re community-builders. And while great care is taken to the architectural design and environmental stewardship of our physical spaces, our creative process is proven when we create the motive for people to engage in real life. Yoga in the park, art exhibitions in a historic warehouse, kids running through a splash fountain, author events hosted by a local bookstore, a farmer’s market on the square, thought-leading panelists dissecting topical issues in the heart of our nation’s capital or a guitar player on a Friday night. These real moments happen in tangible places outside of the digital realm and represents the tailoring of our time. We design these places and curate their programming to cultivate meaningful human engagement, and in the process, seek to inspire communities to call our places their own. Many communities have many choices these days when it comes to where to spend their time. It’s no secret that our country may seem over-retailed or that the rising tide of technology is changing how we interact with one other. But all the screen time or swipes in Silicon Valley cannot replace the service offerings of in-person interactions, the beauty of impromptu interactions, or the reward of human connection. And, as the retail landscape continues to evolve with single-click convenience and consolidating commodities EDENS is uniquely positioned to thrive in urban-minded environments by providing activated places for people to engage. In the words of Maya Angelou, “people will forget what you said and what you did, but will never forget how you made them feel.” This is how EDENS does work; this is how we build, this is how we enrich communities.